Proper nutrition is essential for good health & longevity. Rabbits need hay, a good high fiber pellet (free of nuts/seeds/dyed bits), fresh vegetables, and clean water. If your rabbit is allowed to go without food for too long, a serious condition called enteritis can occur. This is a shutdown of the intestinal tract caused by lack of food to digest. Your rabbit should have a generous amount of hay available at all times. It’s nutritious and a vital source of fiber. You can make a big hay “nest” in bunny’s literbox and he’ll be happy as a clam. This will also encourage good potty habits and minimize hay mess. Don’t worry – bunny won’t eat anything he’s soiled! Commonly found hays are timothy, oat, oat/barley, and alfalfa. Alfalfa is good for growing buns up to one year of age, but is too high in calcium and fats for adult buns. You can often find fresher and cheaper hay at a feed and tack store that carries it by the bale. Ask if they sell it “by the flake” which is a good-sized chunk cut from a bale. You can also inquire at exotic vet’s offices, they sometimes carry hay for sale. Keep it cool and dry in a trash can or storage container stored where it won’t get wet or moldy. Never feed moldy hay to a rabbit, it can sicken them and even cause death. Avoid bargain pellets and “fiesta blends” containing corn/nuts/seeds/etc. The rabbit physiology isn’t built to process the high doses of fats and proteins contained in these mixes. These foods lack the proper nutrients needed by your rabbit and over the years can cause serious health problems resulting in obesity, compromised organ function, and subsequently a shortened lifespan. It’s the health equivalent of raising your child on a diet of nothing but fast food. (Be aware that some pet foods contain a preservative called ethoxyquin, (or BHT) which is a known cancer-causing agent.) A good pellet has a minimum fiber content of 25% and a maxmimum protein content of 14%. Pellets should be fed in limited measured amounts daily, varying by the weight of your rabbit, it’s breed, or health issues. Oxbow Brand makes an excellent pellet with formulas specialized by age. (Bunny Basics T for adults and Bunny Basics 15/23 for juveniles.) Two other widely used formulas are Purina Lab Rabbit and American Pet Diner. (APD also has 2 pellets: timothy and alfalfa). Brown’s brand is o.k. too. Cilantro/ Italian parsley/ Curly parsley/ Basil/ Mint/ Carrot tops/ Alfalfa /radish /clover /snow pea sprouts/ Wheat grass (especially when sick)/ Brussels sprouts/ Endive/ Red/ green/ romaine lettuce/ Radishes w/tops/ Spinach/ Watercress/ Tomatoes (remove ALL greens! )/ Collard/ mustard/ dandelion/ turnip greens/ Celery/ Beet tops/ Chard/ Kale/ Bok choy/ Broccoli/ Pea pods (the flat kind)/ Radicchio/ Gourmet baby greens mix. NO ICEBERG OR OTHER LIGHT-LEAF LETTUCE, POTATO OR POTATO PEELS, RHUBARB, RAW BEANS OR CORN, OR ANYTHING OLD/SPOILED/MOLDY. 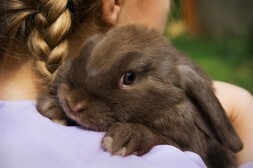 A good feeding rule is: if you wouldn’t eat it, don’t feed it to your rabbit! Always clean, always cool, always available. Use a heavy untippable crock or a sipper bottle – or both in case bunny manages to tip the “untippable” crock! Never allow your bun to drink water with algae in it. Check the sipper bottle each time you refill it to make sure it’s delivering. (Sometimes the little ball gets stuck and water can’t come out). Banana/ Mango/ Pineapple/ Peach/ Apple/ Cherries/ Kiwi/ Watermelon/ Cantaloupe/ Berries/ Orange and other citrus/ Papaya. NO SEEDS OR PITS. Pineapple, mango, and papaya all contain a natural enxyme called Papain which is thought to break down/prevent hairballs. ALL FRUITS SHOULD BE GIVEN IN MODERATION. 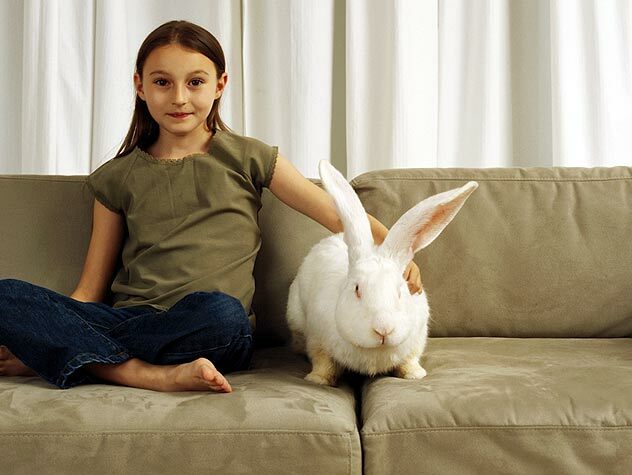 Most treat foods sold for rabbits are largely sugars and fats and should be avoided. Yogurt drops, seed/nut bars, corncobs, wafer snacks etc. are garbage foods. Stick to dried fruits devoid of extra sugar or sulfites. Carefresh has a dried apple treat. Brown’s has a crunchy alfalfa heart-shaped bisquit. We sell dried strawberries and bananas called “Just Fruit” at www.rabbitshop.com. Moderation is the key for any snack food.